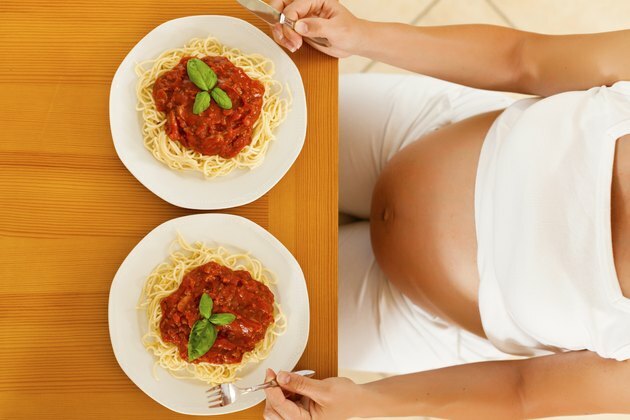 What Does It Mean When You Crave Pastas When Pregnant? Many women experience cravings for specific foods during pregnancy, according to Pregnancy.org. Pasta is only one possible craving; others may include sweet, salty, sour, spicy or protein-rich foods. Knowing the different potential causes for craving pasta while you are pregnant may not ease your cravings but may help you satisfy them in a healthy manner. The desire to indulge in a favorite food can be overwhelming during pregnancy. Although it can be difficult in some cases to pinpoint the exact cause of a particular craving, many medical professionals believe that the hormonal changes that occur during pregnancy are often responsible, according to Parents.com. In fact, cravings can ebb, flow and change depending on the particular stage of the pregnancy and underlying hormone levels. In some cases, food cravings can be the body's way of telling you what you need to eat, according to BabyCenter. For example, pasta tends to be quite rich in carbohydrates, fiber and magnesium, depending on the recipe and manufacturer. A pasta craving may be your body's attempt to signal a shortage in one or more of these nutrients, at least in some cases. Similarly, cravings for meat may indicate low levels of protein, and women who long for pickles may need extra sodium. Many pastas are high in sugar, which prompts the body to produce serotonin. This important neurotransmitter is largely responsible for feelings of happiness, potentially causing pregnant women to crave foods that will increase their production of serotonin. This can be potentially problematic if it tempts you to overindulge in unhealthy foods. Pregnancy cravings should not be ignored, but they should also be handled in a healthy way. Overindulging in sugary or salty foods can lead to weight gain and other health problems. If you experience these cravings, you should attempt to satisfy them in nutritious ways. For example, instead of binging on a large plate of alfredo-smothered white pasta, try enjoying a small serving of whole-wheat pasta topped with a low-sodium tomato sauce. This healthier alternative will satisfy the craving without adding too many calories or sugars. Your doctor can provide you with more specific guidelines on how you should handle your specific cravings. What Do You Have When You Always Crave Protein? What Does It Mean to Crave Garlic? Can Eating Too Much Pasta Be Bad?